Not quite skilful enough to build that dream tree-house? No matter, a little search on the internet can find the best value garden playhouses for kids. Before starting your search, be realistic about the space available and about the optimum size. You don't need to have a huge edifice. Once kids get past the age of nine or ten, they are usually too cool to hang around in playhouses. Although you might be tempted by garish plastic playhouses, the initial savings you make will be balanced out by subsequent misery at the eyesore in your back garden. It's worth spending a little extra at the outset, to find a playhouse that you can live with. Shire playhouses, stocked online by several companies, including shedstore.com, have a decent reputation for providing robust and attractive wooden playhouses. Their Kitty and Pixie playhouses are simple but spacious, perfect for four to eight year olds. Home assembly is not entirely simple, but perfectly manageable with a minimum of joinery skills. Shop around online for the best deals. A Kitty playhouse is available at an offer price from £239 from elbecgardenbuildings.co.uk. DIY stores like B & Q (diy.com) now stock a range of playhouses at competitive prices. Their basic Playhut playhouse starts at the special offer price of £109.98. 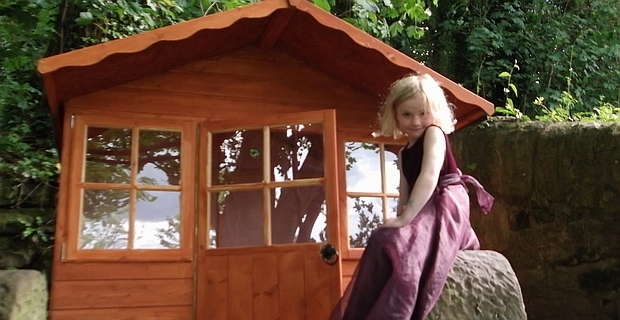 For something a little more colourful and elaborate, their Keter Villa Playhouse costs £179.98. Playhouses should be protected with a couple of coats (at least) of weatherproofing, either in the form of staining, varnish or paint, to keep out the elements.